Bend's Ryan Trebon was a favorite going into yesterday's USA Cycling Cyclocross National Championship race in Verona, Wis. And Chris Jones and Adam Craig, two more Bend residents, both had very real chances at finishing on the podium. It would not have been surprising to see at least two Bend racers inside the top five. Instead we got none. After a brief stint at the front of the race Treefarm faded and eventually finished seventh. Craig, who has also shown good form as of late, struggled at the start and ended in 16th. Chris Jones did not start due to an injury during his pre-ride. Among the Bend pros, Barry Wicks rode perhaps the best race and claimed 10th. Amazingly, it was southern Oregonian Jade Wilcoxson who had the best result of the day. In the elite women's race the neo pro fought all day in the frozen mud and finished second to Katie Compton, one of the best 'cross racers in the world. Jade crushing the New Year's Revolution race in Medford. 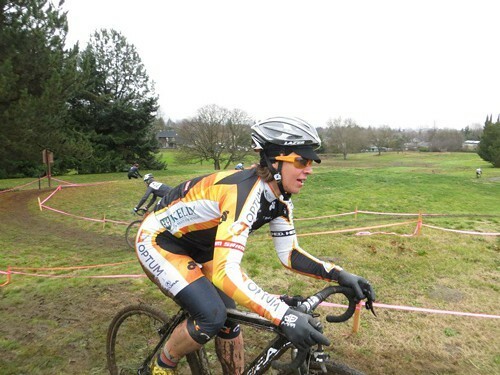 The result, though, came as no surprise to the many Oregonians who raced against Wilcoxson during the 2012 'cross season. The Optum-Kelly Benefit Strategies rider, who lives in Talent, Ore. (it's near Ashland), cranked out multiple wins and even logged a fourth-place finish at the USGP in Bend. Her ride yesterday proved she's one of the best. Well done Wilcoxson. Making us Oregonians proud. Velonews took notice and published this today. Jonathan Page, whose parents live in Bend, won the elite men's race.